Wondering what companies made the most money in 2009? Look no further than your car’s gas tank. Companies involved in the oil business dominate the list of the most successful worldwide businesses of 2009. And if you’re looking for those companies that suffered the biggest losses after the economic crisis of 2009, you’d do well to focus your attention on the housing and auto industries. 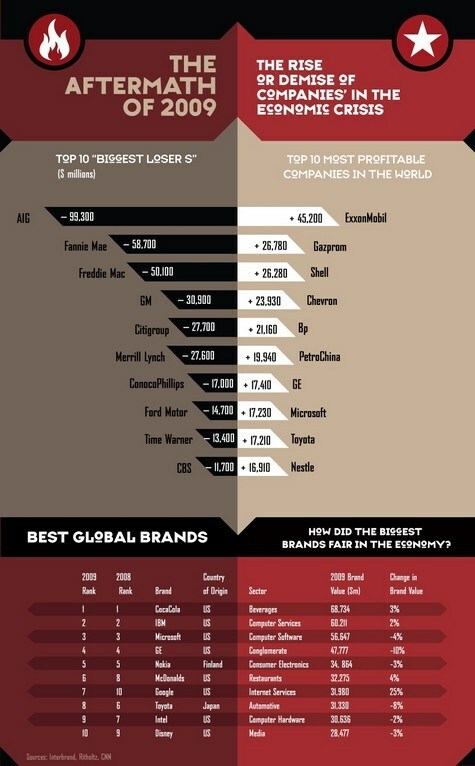 The list of the top-10 biggest losers of the year is dominated by companies working in these businesses. The names of the biggest winners and losers of 2009 shouldn’t be much of a shock to anyone who followed the news coverage of the country’s continuing economic slump. For instance, the biggest loser of 2009 was insurance giant AIG, which posted a loss of more than $99 billion dollars in 2009. AIG had reported a healthy profit, of $9.3 billion, as recently as 2007. The insurance company, though, was at the forefront of the country’s economic crash, and received loads of bad press as it relied on a huge government bailout to stay afloat.